Mr. and Mrs. Frederick Ayer’s house in Prides Crossing, 1906. My cousin Neil recently shared some family albums with me: the oldest one belonged to his grandfather, Frederick Ayer (Jr.) (1888–1969), who kept it in 1905 and 1906. Over time, the images and the captions have faded, and the book’s middle section is held together with ancient cellophane tape, but Uncle Fred obviously cared about the record he was keeping. One of the most puzzling, and therefore interesting, images fills almost an entire leaf of the album; the identifying captions are squeezed out to the page edge: D. Sohier, D. Beal, F. Ayer Jr., etc. I despaired of identifying where or when the photo was taken until I had scanned it: enlarging the image and the names listed, I was also able to read the explanatory text trailing off below the photo: “Mr. Loring’s play, ‘Alladin,’ August 1905.” This was a very large hint, along with some of the other names I could now read, since the Sohiers and Lorings appear in the 2011 Lowell genealogy; furthermore, the photo was taken soon after the Ayers moved out to the Prides Crossing section of Beverly, Massachusetts, where the Lorings were their neighbors. Back row, standing, from left: William Davies Sohier (1889–1969); William De Ford Beal (1888–); Frederick Ayer (1888–1969); M. Lee; Margaret Thomas (1889–1981), who married William Tudor Gardiner, Governor of Maine 1929–33; M. Robinson; Morton Peabody Prince (1889–); Caleb Loring (1888–1954); Charles Minot Amory (1889–); Morton Prince’s cousin Frederick (1885–1962); the great Harvard athlete George Peabody “Peabo” Gardner (1888–1976); J. Blair; S. Eliot; and Charles Edward Cotting (1889–1985). Middle row, seated, from left: Margaret Thomas’ sister Helen, who married Samuel Dennis Warren; M. Eliot; M. Loring; B. Lee; M. De Ford; Leslie Bradley (1890–1971), who married Roger Wilson Cutler; and Ruth Anthony, who married Lyon Weyburn. 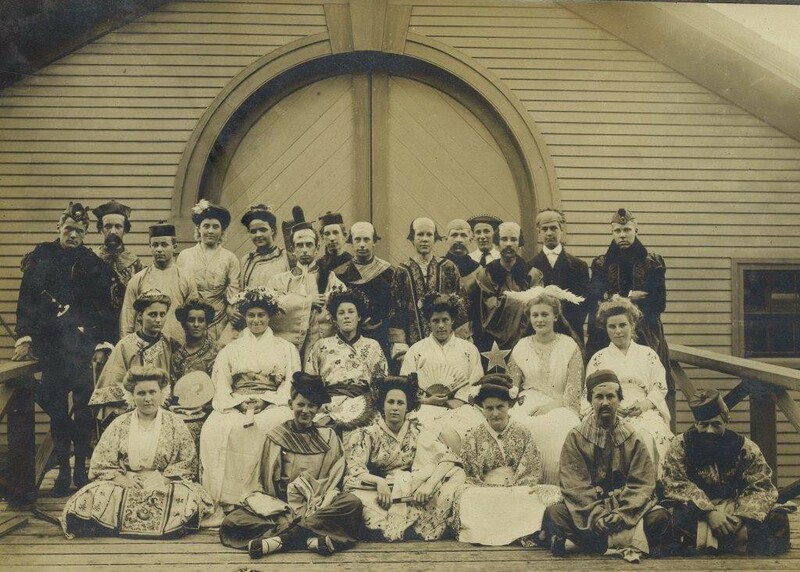 Front row, seated, from left: Leslie Bradley’s sister Rosamond (1888–1969), who married Charles Auguste Rheault; Morton Prince’s cousin Gordon (1888–1983); M. Hooper; Edith Fitz; and two I could not identify (F__ T__ and R__ R__). Scott C. Steward and Christopher C. Child, The Descendants of Judge John Lowell of Newburyport, Massachusetts (Boston: Newbury Street Press, 2011). Another clue: Several of the men in the photo were members of the Classes of 1910 or 1911 at Harvard. See Boston Social Register 1906 (1905), Summer Social Register 1906, Boston Social Register 1908 (1907), and Who’s Who along the North Shore … for the summer of 1911. The Cutlers’ granddaughter married my uncle. What I find most curious is that the play, from its title, had a Middle Eastern theme, but the costumes look Japanese, or at least Far Eastern. What a peculiar juxtaposition! I wonder what the story was behind that. Publisher:	New York : E.S. Werner, ©1905. This is found listed under amateur theatricals in a 1916 catalogue of the St. Louis Public Library. According to “A selected list of plays for amateurs and students of dramatic expression in schools and colleges”, the cast of the Hard & Schell script called for nine boys and three girls in one interior scene, running time one hour or more. It was first published in the November 1900 Werner’s Magazine. However, from experience, I know that directors can expand a cast or settings considerably, as perhaps in the Triumphal Scene that appears in the film. Well, the story is actually set in China! My bad! Thanks, Gerald, for looking into the play — I think you’re probably right, and that Mr. Loring was the director and producer, working from a readily accessible script. It’s interesting that he could wrangle such a large cast — think of the logistics! My uncle’s album of this period shows that he frequently saw a number of people from the cast of the play, so perhaps there was a central meeting spot (at the Lorings?) where the group gathered. I’ve done community theatre for a long time. I can testify that such a production involved a lot of work. And the costumes are so elaborate! Was there a newspaper that might have reviewed such amateur theatricals. Or perhaps a mention in family papers? It’d be great to know more particulars. I found another reference to an amateur performance, probably of a different script but same title, at the Boston Theatre, Washington Street, January 8-11, 1904, for the benefit of George Junior Republic in the 1919 Catalogue of the Allen A. Brown Collection Relating to the Stage (Boston Public Library). Most Aladdin productions that I see in my Searching are Christmas season pantomimes, so your photo’s August dating is most unusual. 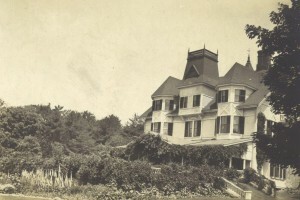 Charles Edward Cotting’s summer home in West Manchester was across the street from the house my family summered in and across Black Cove from my grandmother’s summer house. For years in the ’40s and ’50s, he and my step-grandfather commuted by train into Boston from the West Manchester station (which no longer exists). My grandfather had a summer home in Beverly Farms (Hickory Hill on Webster Avenue) and I remember the Prides Crossing Station. My uncle lived in Manchester and his grandchildren still do. My first thought was that they were performing Gilbert and Sullivan’s “The Mikado”. Perhaps that’s where the costumes came from. I suspect that the Frederick Prince in the Photo was his son Frederick Jr. who was living at the family Princemere estate on Grapevine Rd. in Wenham.